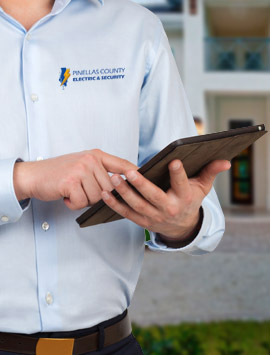 Pinellas County Electric provides quality electrical services to Pinellas County and surrounding areas. Our number one goal is to deliver superior quality, dependable and efficient electrical services at competitive rates. Learn More Click Here to Call Now! Thank you to Pinellas County Electric. We had a fuse box/service panel that needed to replaced immediately due to safety issues. Pinellas County Electric delivered prompt, professional service and got the job done so very efficiently. They showed concern for our situation which showed me that my family and I were working with a trustworthy, experienced company. This is the company to contact with any electrical issues! I’m very pleased the service we got from Pinellas County Electric. The owner was very knowledgeable, kind and prompt. They replaced breaker panel due to safety issue and they sure did a fine and neat job. I really would recommend him to anybody who need perfect electrical work. Thank you for making us sleep better!!! I am a property manager with Shipwatch Realty and have been using Pinellas County Electric for the past 6 months. They have exceeded my expectations every time. Response time is in hours not days and I find them very competitive in their pricing. The owner of the company is very professional and I frequently get calls from my clients complimenting me on our choice of Pinellas County Electric. Honest work. Great attitude. Smart. Good advice for high end jobs. Reliable. The owner is a good family guy, always trusted in my home. I’ve previously never spent the time filling out one of these reviews, but PCE is just a complete pleasure to work with. Good luck with your repairs but you won’t need as much luck if you hire PCE! What breath of fresh air. Electrician showed up on time and was able to identify the problem and fix it quickly. I will certainly use and recommend Pinellas County Electric in the future. The owner and his team were friendly, honest and offered us options that we could afford. They did a great job, leaving our electrical in nice, neat order. They explained the options, made logical recommendations and charged us fairly. We appreciate the work and would highly recommend Pinellas County Electric to anyone who needs electrical work done. We enclosed a screened patio to make it inside space and Pinellas County Electric was the electrical subcontractor. The electrician did all of the fixture installation and wiring exactly as we requested. He clearly took the time and made the extra effort to “do it right” and he showed a lot of pride in the work he did. Highly recommended based on our experience! We wanted to drop Pinellas County a note to let them know how pleased Carol was that the microwave no longer causes the circuit breaker to kick off while preparing dinner – and thanks for sending John back out so quickly to check the entry outlet – I also hope my “testimonial” met your satisfaction. We were more than pleased with your service and have mentioned your company to at least a couple of neighbors already! Thanks again Pinellas County Electric. The owner certainly cares about people! I had an emergency situation at my Rental Property, the Fire Dept. had to shut off the main. Pinellas County Electric responded to our situation in no time. The owner thought I had children and immediately wanted to help, upon hearing that the Fire Dept. was involved. Who really makes you feel concerned that way in today’s world? (not many) Kevin was contacted for us by my A/C Service Company. Not only did he replace and fix the wiring in the outlet, he provided a proposal to upgrade our electric. EVERYTHING that was in our proposal to be upgraded and brought up to code, is EXACTLY the service we received. He went above and beyond his duty, responding in our time of need was just unsurpassed. Thank you, Pinellas County Electric, I hope anyone who needs electrical service finds you! Professional, Courteous and Prompt. Pinellas County Electric rocks! I called/emailed several other electricians and the customer service was pathetic. I received no response from the first business and “maybe next week” from the 2nd business. I scheduled an appointment with a 3rd business, took a day off work, and they weren’t able to keep my appointment. Then I called Pinellas County Electric. They were at my house in less than an hour. They quickly diagnosed the issue and made time to get the work done the next day. The work was high quality, the prices were fair, and the crew was friendly and professional. I’ll definitely call Pinellas County Electric again. Great company!!! They came out on a Saturday and were very knowledge about a car charging station to be installed in my home. And took the time to really understand what was there and what would be needed to make it all work correctly. Then the owner and his crew came out and did the job in the time they said it would take. Great Guys and Great company… I would use them again!! Which I am getting them to quote something for the company that I work for in Tampa! Regardless of the electric issues we have ever had, PCE is always on time and the work is outstanding. Highly recommended!!! I couldn’t be more pleased with PCE!! Kevin was very easy to talk to about my needs and provided a very fair estimate. I couldn’t be happier with the quality and expertise of their work. John and Ed were great and even cleaned up after they had finished. I have some more electrical work I would like to have done soon and I will definitely be calling PCE to do it!! I would rate PCE 5 stars for being AWESOME!! We had a major electrical outage at our Largo home. Unfortunately the outage came on a Saturday and I was afraid that I wouldn’t be able to get an electrician to fix our problem until Monday. I contacted Pinellas County Electric and was directed to to Kevin the on call electrician. Kevin took the time to ask me the nature of our issue and said he could come out but he thought the problem was a low voltage issue with the transformer of Duke Energy. He suggested we have them come out first. Duke power came out two hours later and our problem was fixed. The owner of Pinellas County Electric then called me back to make sure the problem was resolved. I appreciate their efforts and will definitely use Pinellas County Electric the next time I need electrical service. The owner and his team at PCE are awesome! They have done multiple jobs for me and my family over the past few years. They are professional, knowledgeable and fair. I highly recommend them to anyone in need of electrical & lighting services! Hello, my name is Amy and I just purchased a new Chevy Volt; an electric car. And I wanted to get a car charging station at my home. The owner came out and walked us thru what needed to be done and how to do it correctly. He also had suggestions on taking steps to get it done if that is what we needed to do. Then PCE came out and got the job done perfectly!!! Great Work!! Thank you!!! During the remodeling of our home, I interviewed several electrical contractors in the area. I was selective on choosing a company because I have been burnt before by poor quality contractors. Cost was a consideration, of course, however Quality was above all else. After dismissing a few electric companies, I interviewed Pinellas County Electric and I knew I had met the company that I trusted my business with. They were extremely courteous, knowledgable, and straightforward in their presentation. But most of all, the quality was top-notch. The work was clean, and they left the work site cleaner then when they came. As an added bonus, I found their rates to be extremely low. I couldn’t have been happier and I would recommend them to anyone. Thanks again! At nine o clock at night on a Friday, our electrical panel started smoking. I looked in the phone book and found no one to come out. I lastly called Pinellas County Electric, I talked directly with the owner who was nothing but satisfying. He came out and found that our surge arrester had been hit causing it to smoke. He was very polite and informative to us. I would recommend them to anyone seeking an “Real” electrician. With our new Flat Rate Pricing option you can choose to know exactly what to expect before the job begins, and you’ll never have to be surprised after time and materials are added up. We will work by the job and not the hour. Please ask one of our team members for more details. 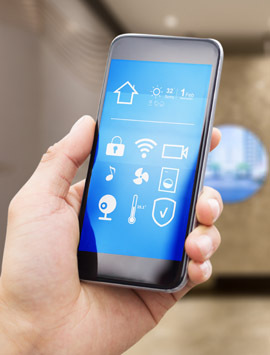 Nearly everything in your home — including air-conditioners, thermostats, lights and garage doors — can be connected to the internet and be remotely controlled with a mobile device or smart speaker. Pinellas County Electric now provides these installations.